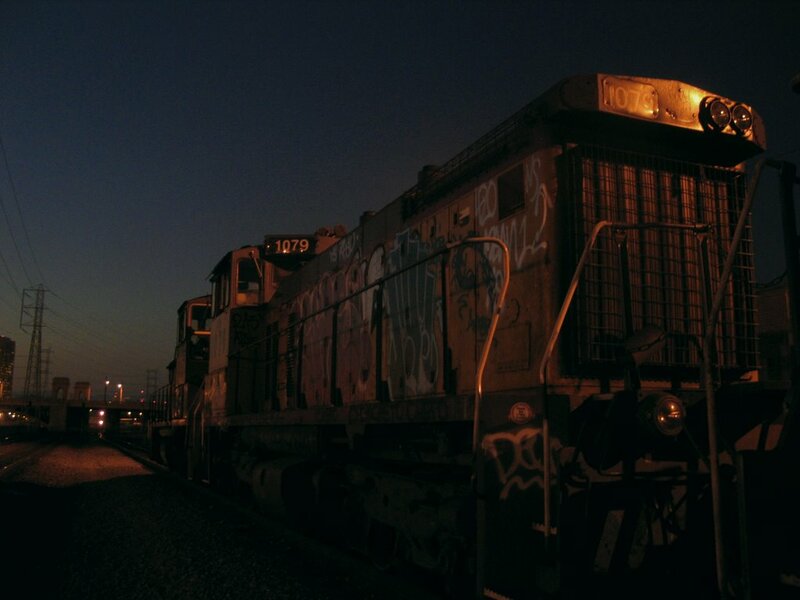 This is a train parked down by the LA river on the other side of the Chinatown area. 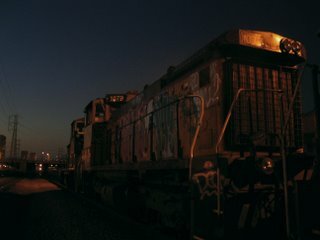 I was doing a typical nocturne photo jaunt when I found it. When I did the painting later in studio, I decided to try and follow some of the color distortions that come from amateur night photography were light goes warm. I pushed that to the point were it kind of had a expressionist feeling. Oil 11x14 on linen. I'm reading a book on expressionism, and lots of the paintings in the book have the color intensity that I see here. Emil Nolde is my favorite (see my avatar). I haven't been brave enough to try colors like this in my own painting in a long time. Really nice. I think the colors work well. I love the power and intensity of trains. You could push this even more as you get into the foreground/front of the train....! You could make little cottage industry in doing fabulous trains with amazing skies! This is very intense. I don't know, there's just something about the reds on the locomotive that I love the hell out of. I know I used the same word on Manley's blog, but there's some kind of malevolence. If I should attribute an emotion to a non-living, man-propelled machine, I'd say the train is really pissed. Nice! Are you using any palette knife? Also are you mostly mixing on the canvas or the palette--keeping a limited palette, and do you adjust that based on the subject? Would you ever consider showing your photographs? Or do they get destroyed? Bright colors are tough to do. What gave me the courage to push the colors in this case was I felt the painting was going wrong so why not commit suicide with a flare? After I didn’t care, it kind of came together; I was trying to hard to make subtle colors work. I learned that the darker you go the less subtly reads ... I think… At least this time. thaks AW I have a few more in me. I find a lot of life ( and death) in machinery. I don't think Steven King was to far wrong. The malevolence is apt... trains and people don't mix. Next to cars and tanks I think they have killed more people that any other form of transportation. Remember Duel? Great little tv movie. I always use pallet knife on the thin lines, and sometimes on big areas for texture, but not in this case. I'm not sure about you mixing question... But I don't pr- mix like some artists, I don't plan that far ahead. I have a palette of colors laid out form the tube when I painting out side, in studio I put out only a few colors at a time and clean off the whole shebang when I'm done. I mix each color on my palette for each new area, when enough colors are our out in my main pool of colors I don't have to go back that much to the tubes, I try and make do if I can. I hate to destroy the mystery, but in the sprit of artistic camaraderie, I'll show one in this one time. I'll update the entry. Wow, the photo is even really well done. No, I've never seen Duel, though I think now I'll have to, because now you got me curious, jackass! Aw. . .I'm glad that I missed the photo. I assume that the deleted comment was yours to me, William. I didn't intend for you to destroy the mystery. I was curious if the photos loose something after the painting reaches a point. Do you discard them? Do they go into a file? Imagine trying to do this before a digital camera? Well. . . after reading brogrimm, I kinda wish I saw it. Maybe attach an image in an email. That's great how you pulled so much from your refrence. 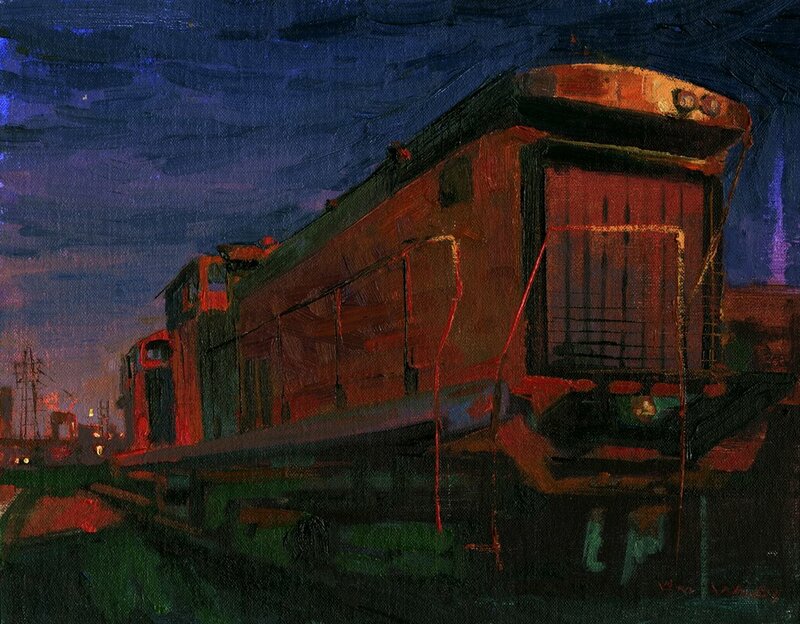 The photo looks quite dark, yet your painting of the train reads quite well. BG-- Duel was a Steven Spielberg TV movie it was so simple and strong it got him on the map. I stared Dennis Weaver as a man menaced by a mysterious big rig that didn't seem to have a driver. The photo is up on the blog, I just edited my reply for spelling. Oh thanks, sorry about my previous comment, Blogger is acting wonky. I wasn't seeing the photo and it said that you had only five comments. I refreshed a couple times and there it is! Beautiful. Bill- That is truly a Satan-red train to Hell! But a beautifully painted Satan-red train to Hell. thaks Bill that's were I'm headed so I might as well get used to it. I love the green areas. Absolutely wonderful, Bil.... you really capture the 'soul' of this train... you did know that trains have souls, right?